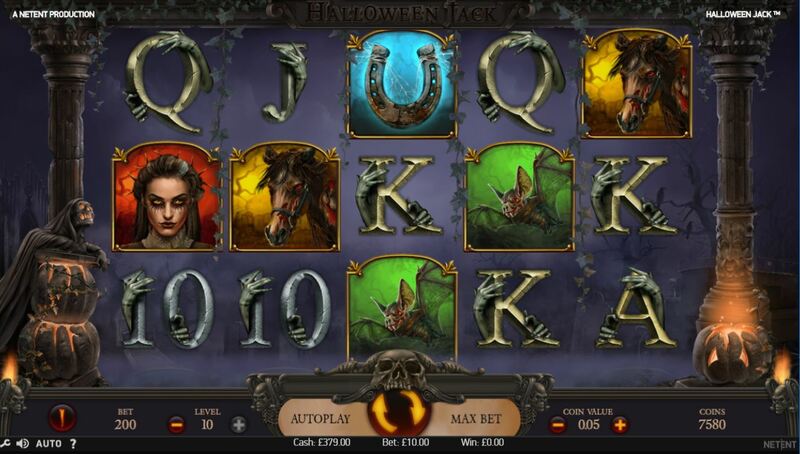 Halloween Jack slot has a twist in the name which will become apparent very shortly when you see the details of the game mechanic, but until then the theme needs little explanation. Transparent reels full of spooky symbols spin over a background consisting of a creepy night time scene with a ruined temple, vines and flaming pumpkins keeping guard. In terms of scariness only Microgaming's Halloween slot based on the 1978 Movie really beats it as most others such as Halloweenies are just childish. The music and sound effects are pretty good too and really add to the dark atmosphere the game attempts to engender but I must say getting out of here with my bankroll alive could be tricky! We are given 20 paying lines on Halloween Jack over 5 reels of 3 rows apiece. Icons are single and naturally we get some sinister picture symbols for the best 5-of-a-kind pays. Zombie awards 50x our 20-coin bet, Horse 37x, Bat and Raven 12x and the supposedly lucky Horseshoe 6x. Five card values make up the rest ranging from 5 to 1.5x stake for a full line but it's the Wild Pumpkin which holds our interest here! 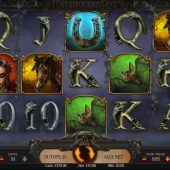 The Evil Pumpkin appears on reels 2 to 5 and when it does not only does it triple any wins it forms part of, but awards free respins moving one reel leftwards each time until it's disappeared from the grid and then your accumulated winnings are paid. Three or more Treasure Chest scatters anywhere don't pay a win but award 10 free spins. You can't retrigger them but you are allowed just 5 extra spins for 3 more scatters during the spins. There is some light added to this dire and gloomy scene now as a Lantern may appear on reel 5 and this can gradually activate some Wild enhancements. If you accumulate 3 lanterns a double-stacked Wild is now created and replaces the single one. Get 6 Lanterns and this turns into a triple-stacked Wild and finally 9 Lanterns will activate the Expanding Wild. The Wilds still award repsins as in the base game and should you get a full screen the sequence as they wander off the reels will generate thousands times your bet!